Katrina Markoff ‘s nickname, Wild Ophelia, was inspired by her childhood experiments with unusual ingredients and chocolate at her family’s fruit stand. She carried her passion and creativity into her career, founding Vosges Haut-Chocolat, and she is recognized as a visionary chocolatier for her fusion of high-quality chocolate and exotic ingredients. Katrina’s second company, Wild Ophelia, partners with other food artisans in developing upscale, distinctly American, chocolate candies. Wild Ophelia chocolates are made with all-natural ingredients, are manufactured with 100% renewable energy, and are packaged in 100% recycled materials. Along with the company’s commitment to producing high-quality chocolate in an environmentally responsible manner, Wild Ophelia’s mission is to educate Americans about their food sources and encourage them to really appreciate their food. 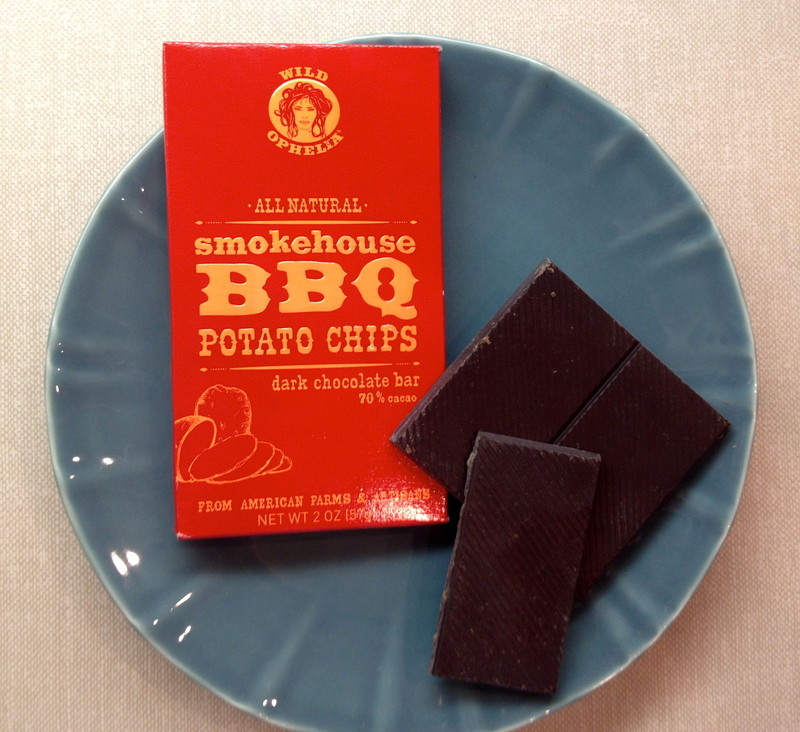 Because I’m crazy for sweet and savory combinations, we sampled Wild Ophelia All-Natural Smokehouse BBQ Potato Chips Dark Chocolate Bar, which pairs Wild Ophelia’s 70% cocoa content confection with Billy Goat Chip Company’s BBQ Chips for a warm, spicy, dark chocolate treat. Billy Goat BBQ Potato Chips were born in the first gastropub in St. Louis. The restaurant’s chips became so popular that commercial production was practically demanded. The handmade chips are made from thinly-sliced potatoes dusted with Billy Goat Chip Company’s Kicker seasoning. We love Wild Ophelia’s mission to build cooperation among American food artisans, and the great-tasting result of the partnership with Billy Goat Chip Company. The complex flavor combination of chocolate, potato chips, and BBQ spices makes the last bite as interesting as the first. Join Wild Ophelia’s “American road trip through chocolate”! Wind & Willow provided the winning snack for our Super Bowl spread this year. I had their Savory Herb & Pecan Dip Mix on hand, and it couldn’t have been easier to prepare. A few hours before the game, I stirred together the dip mix and the included package of chopped pecans with mayonnaise and sour cream. The harder part of the process was waiting for an hour or two for the flavors to blend! Patience paid off when the snacking began. With a mayonnaise and sour cream base, you know it is a super creamy dip. The herb blend is flavorful without being in-your-face strong. It isn’t hyper-salty as many packaged dips are. Green bell pepper, onion and garlic add tasty texture and the dip’s costars, pecans, are just crazy good. The dip disappeared quickly and Allen commented several times that we could have it again anytime! There is a sweet and savory dip recipe on the box that calls for crushed pineapple and cream cheese, and that might be the way we have it next time. It really sounds good. 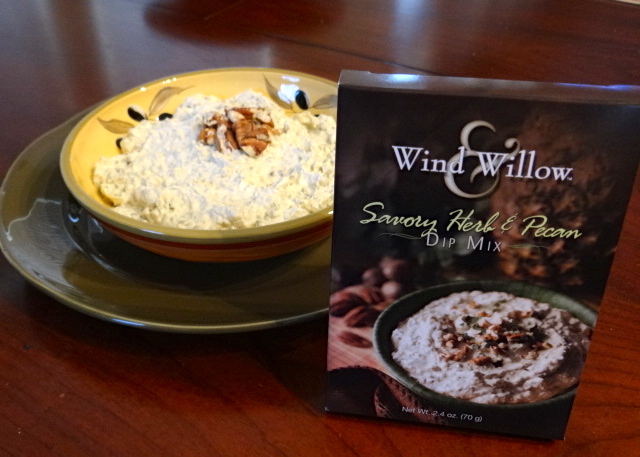 Wind & Willow is a family-owned gourmet food company that has been producing cooking mixes since 1991. They offer a large variety of sweet and savory cheeseball mixes, hot and cold dip mixes, soup mixes, salsa mixes, and spiced cider mixes. Their baking mixes sound heavenly, too. How about whipping up a recipe of Butter Rum Bread Pudding with their Caramel Butter Rum Cheesebake Mix? Check out Wind & Willow’s website to find an online or local retailer.